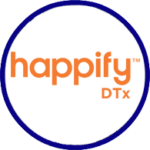 Happify Health provides digital health interventions that, when completed 2-3 times per week, have been shown, through randomized clinical trials, to decrease the symptoms of stress, anxiety and depression and improve resilience of users by 25-30%. Our interventions are developed in partnership with leading clinical researchers and are based upon the application of positive psychology, cognitive behavior therapy, and mindfulness. Happify Health has had 4 million people use its therapy to improve their mental health and works with pharmaceutical companies, health system, health plans and employers to improve the mental health of their patients, members and employees. Parks, A. C., Williams, A. L., Tugade, M. M., Hokes, K. E., Honomichl, R. D., & Zilca, R. D., (2018). Testing a scalable web and smartphone based intervention to improve depression, anxiety, and resilience: A randomized controlled trial. International Journal of Wellbeing, 8(2), 22-67. doi:10.5502/ijw.v8i2.745. Carpenter J, Crutchley P, Zilca RD, Schwartz HA, Smith LK, Cobb AM, Parks AC. Seeing the “Big” Picture: Big Data Methods for Exploring Relationships Between Usage, Language, and Outcome in Internet Intervention Data. J Med Internet Res. 2016 Aug 31;18(8):e241. doi: 10.2196/jmir.5725.